Europe turns right and Latin America turns left. This was a distinct feature of the political weathervanes of Europe and Latin America in the past decade. The recent Syrian refugee crisis, along with the terror attacks in Europe, has reinforced Europe's right-wing political parties; whereas the latest elections in Argentina and Venezuela, however, both suggest that the left-wing is waning in Latin America. 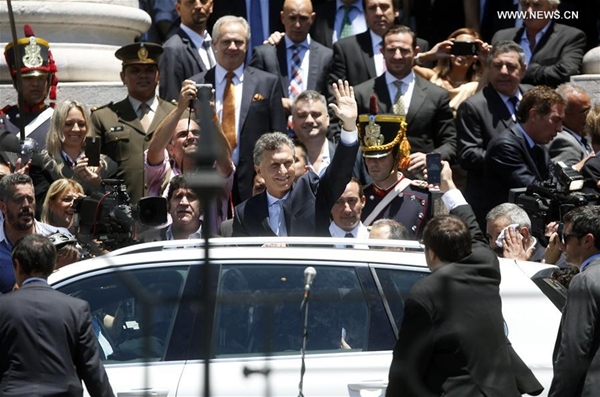 In the latest Argentinian presidential election, the leader of the opposition, and founder of the center-right party Compromiso para el Cambio (Commitment to Change), Mauricio Macri defeated the Front for Victory candidate Daniel Scioli and was sworn in as president on Dec. 10, 2015. Similarly, in the Dec. 6 Venezuelan parliamentary election last year, the Democratic Unity Roundtable (MUD) held a wide lead over the ruling United Socialist Party of Venezuela (PSUV) and its wider alliance, the Great Patriotic Pole (GPP), to mark the biggest change since Hugo Chavez's socialist revolution 17 years ago. Despite the political changes in Latin America, bilateral trade characterized by mutual benefit and win-win results is a prerequisite of China-Latin American relations; hence, the changes will not have a major impact on the bilateral ties. Latin America features the early start of the communist movement. Revolutionaries and activists went on exile to this continent following the revolution failures in the 18th century, including the Paris Commune. These people did not abandon their pursuit for communism, and in fact kindled the communist fire there. Communist movements in Latin America managed to grow amid the influence of the 1959 Cuban Revolution. The Communist Party was founded in most Latin American countries, and the left-wing was poised to grow. Sino-Latin American relations are based on bilateral trade, hence, the political changes in Latin America will not have much impact on the bilateral ties.